After the war, the town was formally laid out in 1817 by Asa Morgan and Charles Lucas. 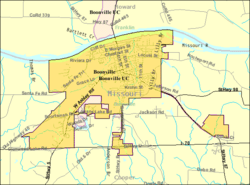 Boonville was named the county seat in 1818. The community's position on the Santa Fe Trail and Missouri River led to many historic residents of the era living there during the westward expansion including George Graham Vest, David Barton, William Ash and George Caleb Bingham. The Cooper County Jail was built in 1848 and remained in place until 1979 with a claim that it was the longest-serving jail in Missouri history. In 1855, Thespian Hall opened and now claims to be the oldest continuously running theatre west of the Allegheny Mountains. More than 400 buildings (most in 14 separate historical districts) are listed on National Register of Historic Places listings in Cooper County, Missouri. During the American Civil War, the community was fought over and held by both sides including in the Battle of Boonville on June 17, 1861, a month before the First Battle of Bull Run which gave the Union control of the Missouri River; and 2nd Battle of Boonville on September 13, 1861; and its capture by Sterling Price in 1864 in Price's Raid. The city was a strategic target because of its location on the Missouri Pacific Railroad. The track was subsequently taken over by the Missouri–Kansas–Texas Railroad. In the 1980s, the track section that traversed the town was converted to parkland, as part of Katy Trail State Park. Today, the "Katy Trail" is the longest rails to trails system in the United States. In 2008, Anheuser-Busch InBev opened the Warm Springs Ranch west of Boonville as the primary breeding farm for the Budweiser Clydesdales. According to the United States Census Bureau, the city has a total area of 7.21 square miles (18.67 km2), of which, 6.89 square miles (17.85 km2) is land and 0.32 square miles (0.83 km2) is water. As of the census of 2010, there were 8,319 people, 2,918 households, and 1,787 families residing in the city. The population density was 1,207.4 inhabitants per square mile (466.2/km2). There were 3,294 housing units at an average density of 478.1 per square mile (184.6/km2). The racial makeup of the city was 83.1% White, 13.3% African American, 0.4% Native American, 0.6% Asian, 0.3% from other races, and 2.2% from two or more races. Hispanic or Latino of any race were 1.9% of the population. There were 2,918 households of which 30.8% had children under the age of 18 living with them, 42.9% were married couples living together, 13.2% had a female householder with no husband present, 5.1% had a male householder with no wife present, and 38.8% were non-families. 32.4% of all households were made up of individuals and 13.7% had someone living alone who was 65 years of age or older. The average household size was 2.35 and the average family size was 2.94. The median age in the city was 34.6 years. 20.3% of residents were under the age of 18; 12.9% were between the ages of 18 and 24; 28.9% were from 25 to 44; 23.4% were from 45 to 64; and 14.6% were 65 years of age or older. The gender makeup of the city was 55.2% male and 44.8% female. As of the census of 2000, there were 8,202 people, 2,667 households, and 1,696 families residing in the city. The population density was 1,190.8 people per square mile (459.6/km²). There were 3,041 housing units at an average density of 441.5 per square mile (170.4/km²). The racial makeup of the city was 80.22% White, 16.84% African American, 0.51% Native American, 0.41% Asian, 0.04% Pacific Islander, 0.40% from other races, and 1.57% from two or more races. Hispanic or Latino of any race were 1.23% of the population. There were 2,667 households out of which 30.2% had children under the age of 18 living with them, 48.5% were married couples living together, 11.8% had a female house holder with no husband present, and 36.4% were non-families. 31.2% of all households were made up of individuals and 15.9% had someone living alone who was 65 years of age or older. The average household size was 2.33 and the average family size was 2.93. In the city, the age distribution of the population shows 19.6% under the age of 18, 20.8% from 18 to 24, 27.4% from 25 to 44, 16.7% from 45 to 64, and 15.4% who were 65 years of age or older. The median age was 30 years. For every 100 females, there were 138.8 males. For every 100 females age 18 and over, there were 146.0 males. The median income for a household in the city was $33,440, and the median income for a family was $40,294. Males had a median income of $28,498 versus $20,739 for females. The per capita income for the city was $14,854. About 9.5% of families and 11.3% of the population were below the poverty line, including 13.4% of those under age 18 and 6.7% of those age 65 or over. Boonville is near the middle of the Katy Trail, a 225-mile state park enjoyed by cyclists and hikers. Katy Trail Bridge in Boonville, which crosses the Missouri near the Isle of Capri Casino and Historic Selwyn Shoe Factory (which has been refurnished as apartments), has been subject of controversy. The railroad would like the bridge to be taken down so the metal can be melted and reused. However, Friends of Historic Boonville and others across the state oppose the idea. 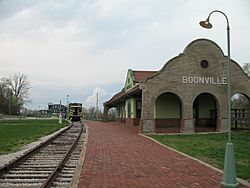 Annually, Boonville celebrates Boonville Heritage Days. This is a summer weekend event that focuses on heritage. Activities include a parade, craft booths, a carnival and much fun for people of all ages. On the last evening there is a fireworks show. Other annual events include the Festival of the Leaves, which is held on the last Saturday in September, and The Festival of The Lights, which is held every Thursday night in September. Shops stay open late, and there are booths with food, free stuff, and games. The historic Thespian Hall, located downtown, is used for concerts, art shows, and plays. The annual Halloween parade features the award-winning Boonville Silver Pirate Band dressed up in a variety of costumes. Twillman Field in Harley Park is also a source of some pride, as it hosts several baseball tournaments every year, including state and regional championships, with ages ranging from 13 to 18. At one time in the late 1980s through 1990s, it was considered by some to be the 3rd best baseball field in the state, trailing only the Major League parks in St. Louis and Kansas City. Boonville, Missouri Facts for Kids. Kiddle Encyclopedia.